Sam Hinkie: Is the Philadelphia 76ers’ lose-on-purpose approach to team-building ingenious or morally bankrupt? Is the Philadelphia 76ers’ lose-on-purpose approach to team-building ingenious or morally bankrupt? Nov. 14, 2014; Philadelphia 76ers forward Nerlens Noel (4) reacts after a play during the second quarter against the Houston Rockets at Toyota Center. Sometime during the last 18 months, the Philadelphia 76ers ceased being a basketball team and became an avant-garde, vaguely basketball-ish idea. 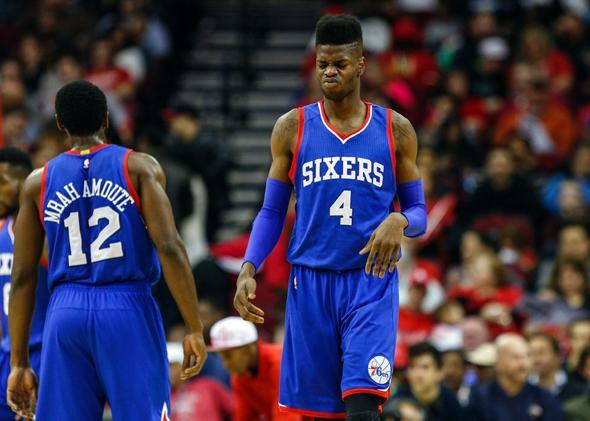 It might have happened in June 2013, when the Sixers traded All-Star point guard Jrue Holiday for a draft pick they used on promising but injured center Nerlens Noel, whom they then shelved for the entire 2013-14 season. It might have happened in February 2014, when they shipped out Evan Turner and Spencer Hawes at the trade deadline for a motley assemblage of journeymen, second-round draft picks, and one former All-Star (Danny Granger), who was immediately jettisoned, lest his basket-making skills infect his new teammates with the ability to win NBA games. Or maybe it happened this June, when the Sixers used the third pick of the 2014 draft on Joel Embiid, another injured center who may or may not play this year, thus ensuring that a team that had lost an NBA-record-tying 26 consecutive games in 2013-14 somehow found a way to not improve. Whatever else you want to say about them, you can’t accuse the 2014-15 Philadelphia 76ers of failing to meet expectations. They are on pace to be the worst team in NBA history according to a variety of statistical indicators, the harshest being their win-loss record: Philly currently sits at 0-10, having lost those 10 games by an average of 16.9 points. In Monday’s loss to the Spurs, the Sixers came out with a starting five of Tony Wroten, Hollis Thompson, Luc Mbah a Moute, Brandon Davies, and Henry Sims. It is not an exaggeration to say that none of them would start for any other NBA team. (Except maybe the Lakers. Probably the Lakers.) The Sixers’ best player is Michael Carter-Williams, a big and talented point guard who was last season’s Rookie of the Year, which means that everyone assumes the Sixers are trying to trade him. Their highest-paid player is Jason Richardson, an aging guard who hasn’t appeared in an NBA game in nearly two years. (Richardson is one of only two players on the roster who is older than 25.) The Sixers employ a small forward who wears number 99 and a point guard who wears number 88, perhaps in homage to seldom-used Eagles wide receiver Jeff Maehl, although probably not. If you do not follow the NBA, you might be surprised to learn that the man who assembled this team has not been fired. The Max Bialystock of this production is general manager Sam Hinkie, a 36-year-old stats maven who’s either a genius or someone with a genius for being called a genius. Hinkie holds an MBA from Stanford, and prior to joining the Sixers in 2013 spent nearly a decade apprenticing under Houston Rockets GM Daryl Morey, arguably the NBA’s most prominent evangelist of statistical analysis. Hinkie is about as far from an insider as one can find in the clubby confines of professional hoops: He played no organized basketball past high school, and before arriving in the NBA he worked for Bain Capital, in Australia. By all accounts, he is exceptionally smart, and he’s nothing if not forward-thinking. In a profession where job security is as precarious as a Dwight Howard free throw, Hinkie—with the support of ownership in Philadelphia—has taken a long-game approach to roster construction that’s visionary, immoral, or both. There’s a widely held belief that the worst thing an NBA team can be is mediocre. If you’re not great, then you might as well be terrible, as a horrible win-loss record is the ticket to the top of the draft lottery, where you just might find the sport’s next superstar. Well-managed teams realize this, and poorly run ones don’t (ladies and gentlemen, your 21st-century New York Knicks! ), which means that sometimes very good teams will become very bad teams, as a stepping stone to vice versa. The best recent practitioners of this badness-to-goodness approach are the Oklahoma City Thunder, whose mid-2000s run of futility (partly as the Seattle Supersonics) landed them Kevin Durant, Russell Westbrook, Serge Ibaka, and the departed James Harden, and a renewed identity as a perennial contender. But no organization has ever bottomed out quite as extravagantly as these Sixers, a team that drafts players who literally cannot play and trades players who can in order to draft more players who can’t. What the Sixers lack in flesh-and-blood basketball talent they make up for in that most alluring buzzword of the contemporary NBA: assets. The one inconvenience of that strategy is that the 2014-2015 Philadelphia 76ers exist, albeit barely, as an ongoing professional basketball concern. While the enlightened fan can be heartened by assets—future draft picks, promising youngsters on team-friendly contracts—he can’t root for them. In the meantime, the actual humans who wear Sixers uniforms recently lost 123-70 to the Mavericks, which wasn’t that bad a result considering they trailed 73-29 at halftime. If you buy what Hinkie is selling, then that score is totally meaningless. The team’s collection of future picks is vertigo-inducing. If the Sixers draft wisely, if Carter-Williams continues to develop (either as a point guard or a trade chip), if cap space can lure quality free-agent veterans, if Noel and Embiid rise to anywhere near their speculative potential, then the Sixers could have a dominant team for years to come in the not-so-intimidating Eastern Conference, and maybe quicker than anyone thinks. But that’s an awful lot of ifs, and in the meantime good luck selling luxury boxes or even nosebleed seats to watch an unprotected 2017 first-round pick. What’s most fascinating about the Sixers is that they’ve literalized pro sports’ championship-or-bust mindset. This team is, essentially, an experiment in how much abuse fans are willing to tolerate in exchange for promises of a dynasty down the road. Philadelphians, as you’d expect, are not flocking to see this gruesome science project—the Sixers are third from the bottom in the NBA in attendance. It’s asking an awful lot of fans to put money into a team that isn’t trying to win, particularly when it seems content to stretch this period of intentional loserdom into something like a minor era. After all, there are words for people who abuse the patience of others, and rest assured that Sixers fans are familiar with all of them. Philadelphia natives take their sports rather seriously, he wrote as he ducked out of the way of a battery. As to be expected, camps have formed. 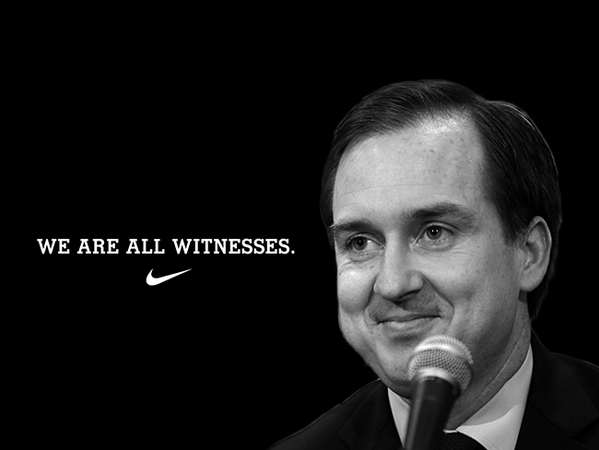 The pro-Hinkie side has taken the form of a half-ironic personality cult: jokily messianic memes abound, #INHINKIEWETRUST is a running hashtag, and the popular blog Liberty Ballers hosted a draft day party replete with Hinkie T-shirts. Tongue-in-cheek as much of this is, there is optimism and even excitement among a certain cadre of Sixers fans, a group that relishes being part of what is, at the very least, a bold attempt to refashion a not-so-successful franchise. It’s easy to caricature all of this as Moneyball on the hardwood, brainy progress squaring off against brawny conservatism. But are the Hinkie haters so wrong to suggest that a basketball team should be built so as to win basketball games? There’s a fine line between outside-the-box creativity and running a franchise like you’re part of some obscurantist, too-clever-by-half fantasy league. While it’s a bit dopey to say that sports exist for the fans, the Sixers’ disavowal of anything like basketball aesthetics nevertheless feels like an affront. And what if it turns out that Hinkie isn’t actually the smartest guy in the room? By taking asset acquisition to its logical extreme, the Sixers may well have convinced the NBA that its current method of parceling out talent is in fact illogical. A few weeks ago, a proposal to reform the draft lottery to disincentivize tanking fell just six votes shy of passing. If significant changes are pushed through while the Sixers’ experiment is in progress, what now appears to be a madcap experiment could swiftly transform into a doomed basketball hellscape. The record for futility in an 82-game season already belongs to Philadelphia, set by a ’72-’73 Sixers squad that went a brisk 9-73 (you’ll hear those numbers a lot this season). That Sixers team was awarded the top pick straightaway, and claimed as its prize future All-Star/coach/television analyst/coke-rap enthusiast Doug Collins. By 1977 they were back in the NBA Finals, after purchasing the rights to ex-ABA superstar Julius Erving. It’s impossible to say what these Sixers will look like four years from now. This year, at some point, the Sixers will win a game. It might happen on Wednesday night, when they play the rebuilding Boston Celtics, or on Saturday, when they visit the unquenchable tire fire that is the Knicks. But it won’t be pretty, and a lone victory (or even 10) won’t stop anyone from wondering if the Philadelphia 76ers are even dumber than they look, or if—in the words of Homer Simpson—Sam Hinkie is stupid like a fox.